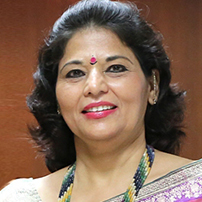 Ms. Mrinalini Kaura is presently working as Director and Principal at Venkateshwar International School. She Msc Gold Medalist and also authored 11 books for Nursery, Primary and Secondary School students. She achieves many awards as Best Student of B. Ed at C.I.E. Delhi University by The Prime Minister Late Rajiv Gandhi and for Top the Delhi University in B. Ed by The Vice President of India – Late R. Venkataraman.